Having extolled the virtues of a small menu in the last post, this one’s all about a restaurant that is decidedly huge. Massive is evidently a virtue at The Druid Garden in Bangalore’s Sahakar Nagar, just off the airport highway. 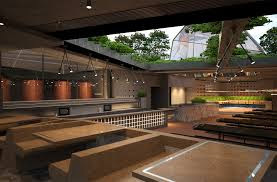 It can seat 500 people at a time, the in-house brewery (to launch soon) is one of the -- if not the – biggest in these parts, both in terms of space and volume of Czech beer it’ll be brewing, and the multi-cuisine kitchen is a sprawl, a luxury few restaurants can afford. To be honest, I am biased towards small restaurants with compact menus that deliver intimate dining experiences. But the style and design of The Druid Garden had me pleasantly surprised. While it’s a vast space, it’s cleverly tiered, providing seating at various levels and in niches. The retracting glass roof is a marvel and there’s a high-end grill and pizza oven lending warmth to the place. The colours and lighting are subtle, the style understated. Such a huge restaurant could easily have gone over the top with the décor; that, thankfully, has been averted. The long bar makes a speciality of its cocktails. Some, like the Moscow Berry Mule (vodka, fresh berries, ginger beer) and Breakfast Martini (orange marmalade, Cointreau, Bourbon) were superb, while others such as the Basil Sees Red (red pepper, basil, tequila, soda), were unremarkable. The chefs deserve congratulations for the bar snacks menu which has on it Spiced Latino Chips of sweet potato, tapioca and plantain and Fried Okra Slivers. No nachos or potato wedges in sight and I was pleased. The Druid Garden Menu is a mix of Indian and global cuisine and covers a vast range; I can only imagine all the activity in that humongous kitchen. The Campagna Burrata (fresh cheese, heirloom tomatoes, blood orange dressing) from the salad list was one of the picks of the menu for me, as was the Asian Spiced Tofu Tacos with cripy quinoa and wasabi mayo. Reflecting the scope of the menu was the Scandinavian-inspired Smorrebrod with Anchovy Paste. These dishes feature in the ‘Small Plates’ menu. Then, there are Burgers, Sandwiches Wraps, Pizza, Grills and Large Plates which run the gamut from Karimeen Polichathu and Andhra Kodi Pulao to Crab Ravioli and Tamale with Chicken. The beef from the grill, I was told, is locally sourced and it was of very good quality and came perfectly cooked. The Druid Garden has a Thai chef and he delivered super quality in the spicy Tom Yum and Pineapple Fried Rice. I find chocolate desserts in most places just too creamy or mousse-like. The Druid Garden’s Hazelnut Torte, was a work of art, with lush textures, intense flavours. I was recommended the Aztec Coffee – espresso martini, vodka-proofed coffee, chocolate, cardamom foam – for an after-dinner cocktail. It comes in a Champagne tulip coated in cocoa and cinnamon and there was just too much going on there. Serving it all with a smile and a spring in their stride was the staff. Here is a team that appeared highly motivated and so very happy to be on the job. Well done! One of the best thotels in goa calangute and one of the budget hotels in goa near beach and also the best beach resorts in north goa offers a wide range of comfortable luxury suites and rooms for the esteemed guests. It also offers best north indian food in north goa best and is one of the famous restaurants in Goa. Thanks admin for sharing this informative article. love the food in Supreme hotel and great service. Thanks for a great tips, This would be a different idea from the routine tips. I will try it. Get the benefits of buy groceries online shopping at the biggest online supermarket the day2day store. This online grocery store is best online shopping without standing in queue. Love the Restaurant, Thanks for sharing. SkynestIndia launch Service Apartments in Gachibowli Hyderabad. SkynestIndia Offering services in Restaurants, sweets, outdoor catering near our location in Gachibowli, Financial District, Nanakramaguda, Wipro circle, Gachibowli, Hyderabad.